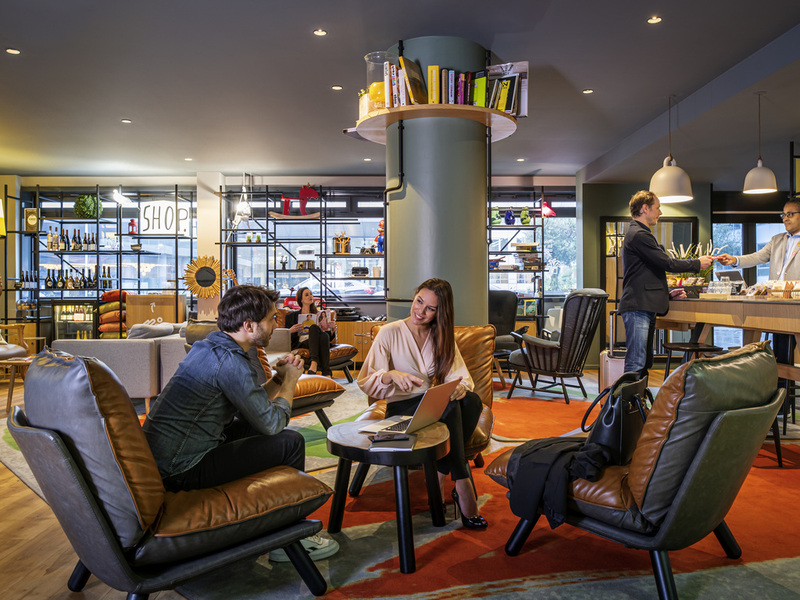 In the heart of Bercy Village and the dynamic East Parisian business district, Adagio Paris Bercy Village offers 139 apartments from 2 person studios to two room, four person apartments. Located a few steps from the Parc de Bercy and the quays of the Seine, the Aparthotel has very easy, 5 minute access to the Gare de Lyon, and 10 min access to the center of Paris by metro line 14. It has a seminar room that hosts up to 20 people. On arrival the check in went quick and I got an upgrade to a bigger room. The room was very nice, clean, spacious and well equiped. The staff of the hotel is friendly and efficient. Breakfast was of good quality also with many options to choose from (for French breakfast standards. Ok although I didn't feel 'welcomed or appreciated on this stay - and I have stay here about 30 times! Our experience was great :) The staff were helpful, the room was clean & easy access to the metro. Would like to know for next time if there is a charge for a early check in. Website doesnt not give that information & noone replied to my enquire. Would come back again. Customer front desk to be improved. Customer front desk is not answering call made from room 207. Requested for universal adapter & it was not available . I believe this hotel is for global citizen. Room smells full of toilet smell, and bed sheet isn't clean with some long hair. And the second day, room out of water for long time. I love staying in this Hotel while in Paris and I did it so many times in the last 10 years. However, the hotel facilities need renovation, particularly the rooms. Last time (Jan. 19th/2019-Jan. 24th/2019) I stayed in Room-505; doors connecting the bedroom and waiting room broken, heating system not working and it was cold in those days, toilette paper holder broken, lights in the kitchen cabinet broken, fridge inner door broken, etc. Moreover, the unfair surprise was late in the evening somebody entered Room-505 with the key the provided him in the front desk. The key holder was indeed for Room-505 I was booked at the time. It was quite unpleasant we both guys facing one-another in the Room's door and wondering who did the mistake. He was nice and apologize for the inconvenience and walked downstairs to the front desk..... Despite all I wrote above, I DO want to book my stay in the Adagio Bercy Village @ Cour du Minervois!!! 1. There were broken electrical sockets in the wall. 2. There were small insects on the floor and kitchen work top table. 3. The wall bed had to be made. 4. The hotel across the road that I stayed in the night before, even though it was 40 euros more, it was in a different universe compared to this place. First bad experience of all the accorhotels I have been to. The communication is really really bad here. I didnt feel welcome at all. Good location. Clean comfortable accommodation with a small balcony. Niggles - kitchen sink was blocked so was pretty unusable. One of the bedside lights didn’t work. These were reported to reception but nothing was about them. We were staying two nights. On returning to the hotel at lunchtime after the first night it was clear our keycards has been cancelled for no obvious reason. Had to queue for 10-15 minutes in reception to get them revalidated. No apology. The stay was perfect, nice room and a nice place. There is one thing , my amex account was charged one night to much (27/11) and I came 28/11. I spoke with the staff there, but he said it was some holding payment that will be refunded. Still I have not seen any refund. I have sent a lot of mails to the hotel, but it seems they don't read mail at all. I never got an answer from them, so now I have to contact american express to see if they can do something, else I have lost 103,55 Euro. Great location but room was very disappointing. Check in was delayed due to several people waiting to check in. Room was knocked around, very hard mattress on double bed, only 2 thin pillows supplied and fold out bed had insufficient quilts. Had to go to reception and request another quilt from the survey staff member. Quite hotel, perfectly located for Accor Hotel Arena. Although no restaurants on the premises, Breakfast is very friendly and plenty other brand restaurants on the village. - My payment has been registered twice (prepaid + paid upon arrival); since then I only get embarrassed smiles and no answer to email or requests to stop this disaster. it is very dissatifying. - Price for the week was very high, then I expect a minimum level of service which I do not see : bad smells from bathroom (well it stinks to be precise) coming into the bedroom itself. -Online check-in does not give you any advantage. Being platinium neither. Only 1 person at reception and a lot of talking, time consuming before accessing to the room which you cannot do before you pay even if the stay has been paid in advance.